Multiple stakes sire Ivory James got six qualifiers over the last weekend. WAYNE, OK�JULY 21, 2016�Royal Vista Ranches stallion battery had a great weekend of qualifying races July 15 thru 17. IVORY JAMES, DOMINYUN and CORONAS FAST DASH sired eight qualifiers to seven different stakes races. Thriving Ivory, a filly by multiple stakes sire IVORY JAMES, posted the 10th fastest time in the RG2 $443,050 TQHA Sale Futurity at Retama Park Saturday night. Angel Hernandez owns the filly out of Shes Dashin First, by First Down Dash. Trainer Angel Sanchez conditions the Bobby D. Cox Texas-bred. In the rich Grade 3 $233,100 Speedhorse Futurity trials Saturday night at Fair Meadows in Tulsa, Dam Strait, by second crop sire DOMINYUN, and Tuxedeau, by multiple stakes sire IVORY JAMES, qualified for the July 30th 350 yard final. The winner will take home more than $88,000. Rodney Reed saddled Damn Strait to the seventh fastest time from eight trials for owner M.C. Stucks. 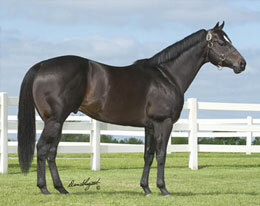 Bobby D. Cox bred the gelded son of DOMINYUN in Texas from the Jody O Toole mare Hottesticketintown. Also a Cox-bred, Tuxedeau ended the night with the final qualifying time for owner Claudio Gonzalez. Kelli Martin conditions the IVORY JAMES colt out of Shiney Copy, by First To Shine. Diamond For Dan, a son of IVORY JAMES, earned the third fastest qualifying spot in the $68,700 Speedhorse Derby for owner/breeder Dan Nicks. R.L. "Rick" Robinson saddled the brown gelding out of First Place Diamond, by First Place Dash. The 350-yard final will also be contested on Saturday, July 30th. Randy Hill and Mickey Johnson's Ivoriona was the seventh fastest qualifier for the Grade 1 $89,000 Speedhorse Paint and Appaloosa Futurity at Fair Meadows Saturday night. Stacy Charette-Hill conditions the IVORY JAMES filly out of Friona, by Texas Hero. Mickey and Stanley Johnson is the breeder. The finals are set for Saturday, July 30th. IVORY JAMES will be represented by the gelding Groupie James in the $59,400 John Deere Ruidoso Juvenile(G3) final on July 30th at Ruidoso Downs. Salvador Soto saddled the gelding to the fourth fastest time for owner Carlos Trujillo, Jr. H & E Ranch, Inc. bred Groupie James in Arizona from the A Regal Choice mare Groupie. David Wisdom's homebred Giant James, a gelded son of IVORY JAMES from the This Snow Is Royal mare Runaway In Style, will complete in the $12,500 NDQHRA Quarter Horse Futurity final on Sunday, July 31st at North Dakota Horse Park. Edward Ross Hardy is the trainer. Vigilante, a Bobby D. Cox Oklahoma-bred son of CORONAS FAST DASH, qualified with the second fastest time for the $5,000-added G.C.F.A. 79 & Under Speed Index Futurity on Saturday at the Gillespie County Fairgrounds. Daniel Luna conditions the colt, out of the Tour de Kas mare Duck Mea Running, for owner Rosa Aguado. The 350 yards final will be contested on Sunday, August 14th.